Everlyn Holland – a concerned citizen. Everlyn Holland writes that claims that the Nobel Prize Committee saw excellence in Toni Morrisons work. She claims that the school system has capitulated to the minority of complainants. Holland, Everlyn & Micklewright, Patti. 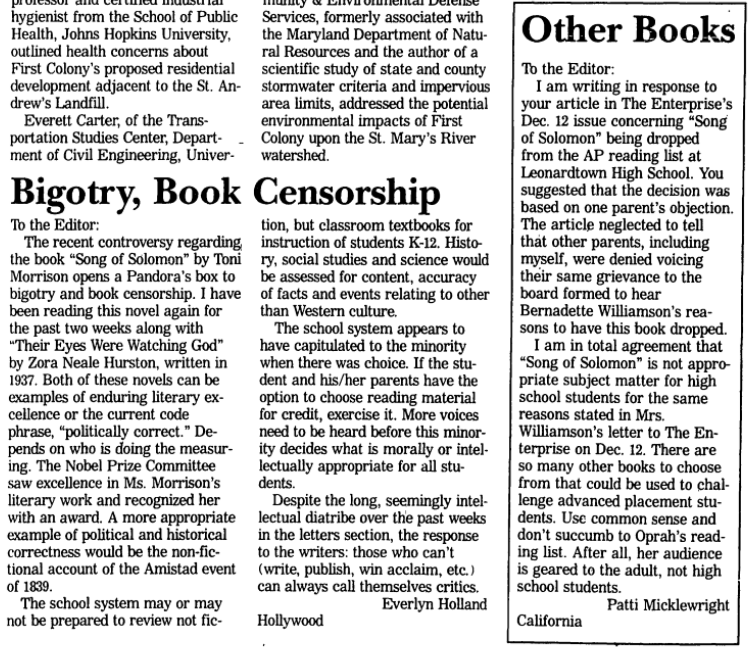 “Bigotry, Book Censorship & Other Books” The Enterprise, December 26, 1997. 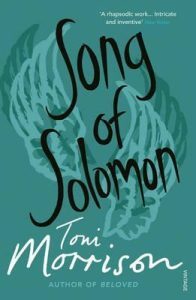 The recent controversy regarding the book “Song of Solomon” by Toni Morrison opens a Pandora’s box to bigotry and book censorship. I have been reading this novel again for the past two weeks along with “Their Eyes Were Watching God” by Zora Neale Hurston, written in 1937. Both of these novels can be examples of enduring literary excellence or the current code phrase, “politically correct.” Depends on who is doing the measuring. The Nobel Prize Committee saw excellence in Ms. Morrison’s literary work and recognized her with an award. A more appropriate example of a political and historical correctness would be the nonfictional account of the Amistad even t of 1839. The school system may or may not be prepared to review non-fiction, but classroom textbooks for instruction of students K-12. History, social studies, and science would be assessed for content, accuracy of facts and events relating to other than Western culture. The school system appears to have capitulated to the minority when there was a choice. If the student and his/her parents have the option to choose reading material for credit, exercise it. More voices need to be heard before this minority decides what is morally or intellectually appropriate for all students. Holland, Everlyn. 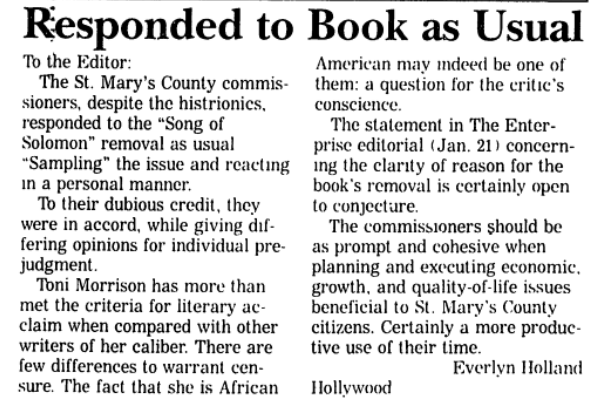 “Responded to Book as Usual” The Enterprise, January 30, 1998. 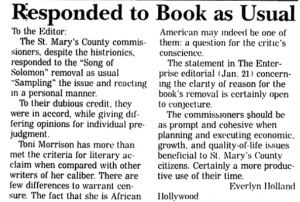 The St.Mary’s County commissioners, despite the histrionics, responded to the “Song of Solomon” removal as usual. “Sampling” the issue and reacting in a personal manner. To their dubious credit, they were in accord, while giving differing opinions for individual pre-judgement. 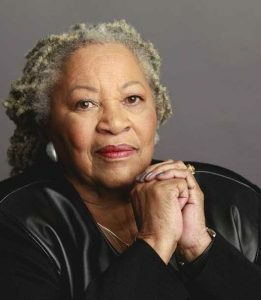 Toni Morrison has more than met the criteria for literary acclaim when compared with other writers of her caliber. There are few differences to warrant censure. The fact that she is African American may indeed be one of them: a question for the critic’s conscience. 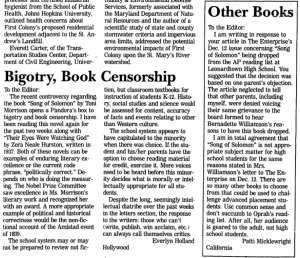 The statement in The Enterprise editorial (Jan. 21) concerning the clarity of reason for the book’s removal is certainly open to conjecture.